So You Think You Can Program. On the screen of a wide-screen TV set are seen the words: SO YOU THINK YOU CAN PROGRAM. A woman's head is visible in a close-up view. Woman: Look! 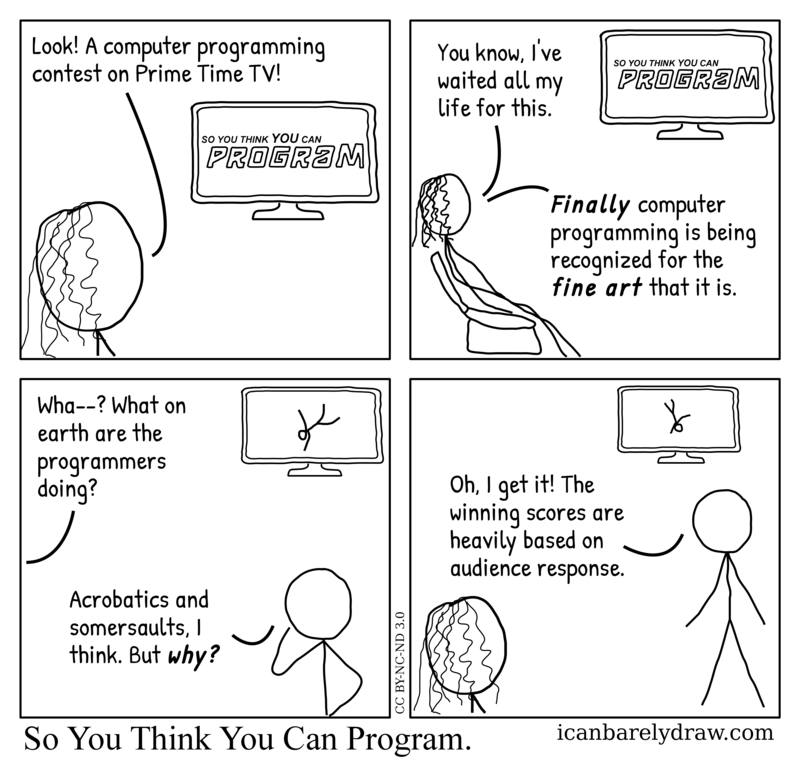 A computer programming contest on Prime Time TV! The next panel shows the woman seated in a comfortable chair looking at the TV set. Woman: You know, I've waited all my life for this. Woman: Finally computer programming is being recognized for the fine art that it is. The next panel shows the TV set and a man standing. On the TV set a figure of a man is seen apparently upside down and at an angle. Off-panel voice: Wha--? What on earth are the programmers doing? Man: Acrobatics and somersaults, I think. But why? The next and final panel shows the woman's head, and the standing man, both looking at the TV set. The TV set shows a man apparently performing a somersault. Man: Oh, I get it! The winning scores are heavily based on audience response. Title: So You Think You Can Program. It’s like the Tester that has barely anything to do with video games.